BIG NEWS! Please join us in celebrating that WOGO’s Congo Medical Mission video is a finalist in the ShareCare awards! Sharecare, the digital health company that helps people manage all their health in one place, today announced the finalists in the Sharecare Awards, a competition to inspire and honor the creators of health and wellness broadcast and digital media programming that demonstrate “sharing care.” The Sharecare Awards is in association with The National Academy of Television Arts & Sciences, New York Chapter, which fosters creativity and inspires artistic and technical excellence through the renowned Emmy® Award. 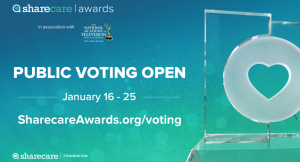 As a finalist, WOGO also eligible to win the Sharing Care Award, a special award bestowed to the entrant that receives the most votes from the general public between now and Friday, Jan. 25, 2019, at www.sharecareawards.org/voting. It’s time for a big HOORAY for WOGO and help us out by VOTING for our video! Thanks!